Over 400 guests, 60 speakers, and 100 journalists representing more than 40 countries. Moreover 240 thousands tweet impressions around the world, 900 followers on Twitter and 1000 likes on Facebook. 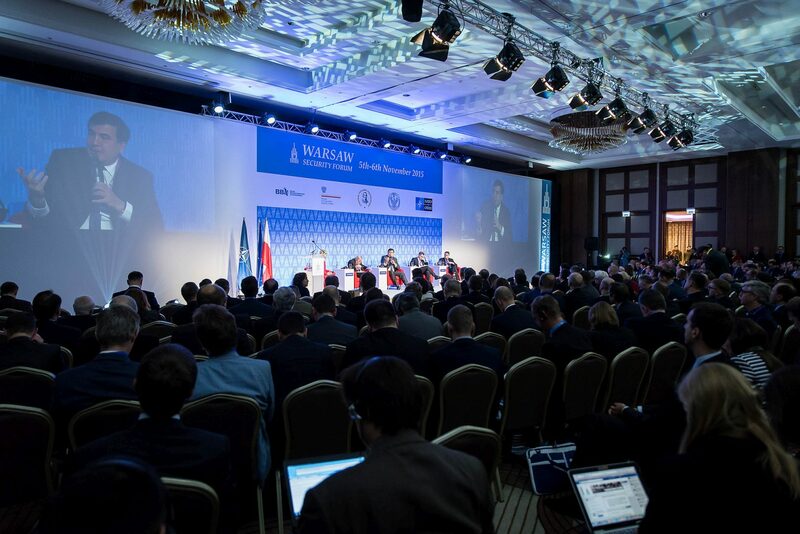 These numbers representing the Warsaw Security Forum 2015 illustrate only a part of the conference that took the security debate to the next level. Welcome remarks were addressed to the guests by the President of the Casimir Pulaski Foundation Mr Zbigniew Pisarski and key state officials: Mr Paweł Soloch, Head of the National Security Bureau, and Mr Tomasz Siemoniak, Deputy Prime Minister and Minister of National Defence of the Republic of Poland. They all agreed that the dialog and exchange of views is the best practice to create response to global threats and instabilities in the region. It is significant that for the second time Warsaw became important place for the Euro-Atlantic security and defence policy debate. It was underlined that Warsaw Security Forum has already started the discussion before the next year NATO Summit which will bring even more attention to Poland as a regional leader in the security sector. This year’s Warsaw Security Forum gathered many prominent speakers and policy makers including: Vytautas Landsbergis, former President of Lithuania; Mikheil Saakashvili, former President of Georgia; Igor Lukšić, Deputy Prime Minister and Minister of Foreign Affairs and European Integration of Montenegro; Pavlo Klimkin, Minister of Foreign Affairs of Ukraine; Linas Linkevičius, Minister of Foreign Affairs of the Republic of Lithuania and Alexander Vershbow, Deputy Secretary General of NATO. The discussion focused on such issues as the current position of the West and its relations with Russia; regional instabilities in the European neighbourhood; future of the Eastern Partnership; immigration; cybersecurity and energy security. We open debate on the Eastern flank in the context of the NATO Summit 2016 in Warsaw and we will share thoughts on reforms in Ukraine as well as policy of Russia in Europe and in conflict in Syria. One of the major reflections of the participants was the importance of the Eastern and Southern flank of the NATO in the short and long-term perspective. Moreover, all shared common and coherent negative opinion on the current Russian security policy. In general, everybody was convinced that annual conference in Warsaw provides unique forum for the international debate and has become top security event in Europe. The Warsaw Security Forum Organising Committee would like to express its gratefulness and acknowledgements to all guests of the Forum for creating the unique atmosphere during the conference and for their input into the debate on “the world’s secure future” – the motto of the Warsaw Security Forum. Videos from the sessions will be available on Youtube and photos on Facebook starting from Nov. 20th.